The lighted makeup mirror endowed with 24 lights which are evenly distributed all along the mirror. The LED lights offer a naturally bright illumination while the tri-fold light design provides better viewing angles. 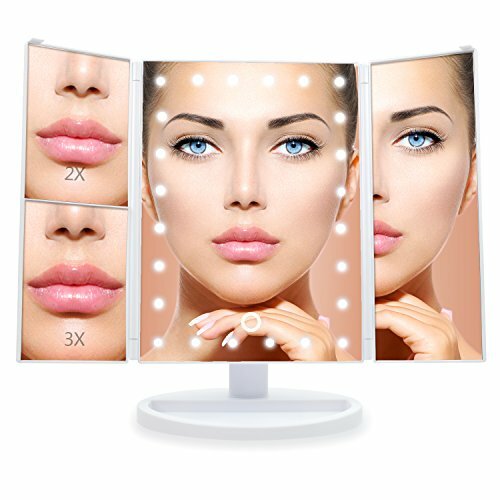 The makeup mirror has 180 degree rotatable stand that can be fixed at any position effortlessly and you can also detach it when not using. The amazing light adjustment allows you to dim or brighten the illumination with ease. 1.This vanity mirror with lights can not store power itself. 2.Please don't power it by battery and usb wire at the same time. UPGRADED 24 LED BULBS: The pack comes with 24 high quality LED lightings so that you can get a well-arranged lighting. You can dim or brighten up the lights with a long press of ON/OFF touch button. DUAL POWER SUPPLY: You can power the led makeup mirror through USB charging cable directly which has been included in the pack or put in four AA batteries which you have to buy separately. If you have any questions about this product by Wondruz, contact us by completing and submitting the form below. If you are looking for a specif part number, please include it with your message. 6Inches 15X Magnifying Mirror with 3 Suction Cups, Use for Makeup Application, Tweezing, Blackhead/Blemish Removal.Comes with 1PC Storage Bag, 1PC Tweezer, 1PC Reminder Card, and 2PCS Non-Dust Cloth. Sandberg Furniture Farmhouse Wall Mirror, Antique Turquoise, 36" x 30"